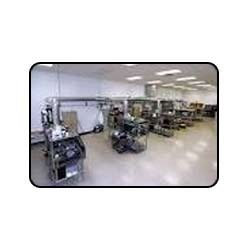 We have Manufacturing Collaboration with state-of-the-art Manufacturing Unit. Wherein we have a setup of Sophisticated Laboratory conforming to international standards. Spread over a large area for substantial production facility, we have quality laboratories that are hygienic and in controlled environment. Our modern machineries accompanied with sophisticated technology helps us to meet the bulk demands from the clients. Many Pharma MNCs are their clients. Kymex Healthcare has developed state-of-the-art warehousing and Packaging facility that is strategically located to ensure smooth and convenient transport. Our warehouse aids in proper storage of our procured product range. Our range is segmented into two sections, one for Tablet and Capsules and other for Injectables. Moreover, the range is stored as per proper labeling and categorization to further facilitate easy identification and timely dispatch. To ensure safe dispatch in the market, our packaging experts make use of superior grade packaging material. Besides, the use of proper packaging techniques and material aids in maintaining the original content and ensure that the range is free from any pilferage.